Assassin's Creed Odyssey isn't out for another few weeks, but Ubisoft is already talking post-launch content for the Greek adventure. Season pass purchasers will get two new story arcs to play through and - less predictably - Assassin’s Creed 3 Remastered. 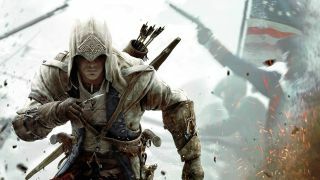 You remember Assassin’s Creed 3 - it was the one with Connor, the half English, half Native American hero who found himself dealing with not just the usual Templars, but the American Revolutionary War as well. It was released back in 2012, so it should benefit from a bit of technological spit and polish, ready to run in 4K and HDR on PS4 Pro, Xbox One X, and PC. Gameplay mechanics and 'ergonomics' have also had some TLC, and if the season pass doesn't appeal, Assassin’s Creed 3 Remastered will also be sold as a standalone title. The two new Assassin's Creed Odyssey stories for season pass holders are Legacy of the First Blade, due in December, and The Fate of Atlantis set for spring 2019. Both are episodic and delve deeper in the treasure trove that is Greek mythology. They join the free content - that Ubisoft promised when it revealed the series would be taking another year off - which all players will get after the game's October 5 launch. That includes episodic quest lines named The Lost Tales of Greece and special in-game events. Assassin’s Creed Odyssey will be released on October 5, but eager beavers who invest in the Gold, Collectors, and Ultimate Editions will have access to the game three days early. Check out our hands-on Assassin's Creed Odyssey preview to find out why we're so excited about murdering our way around Ancient Greece.